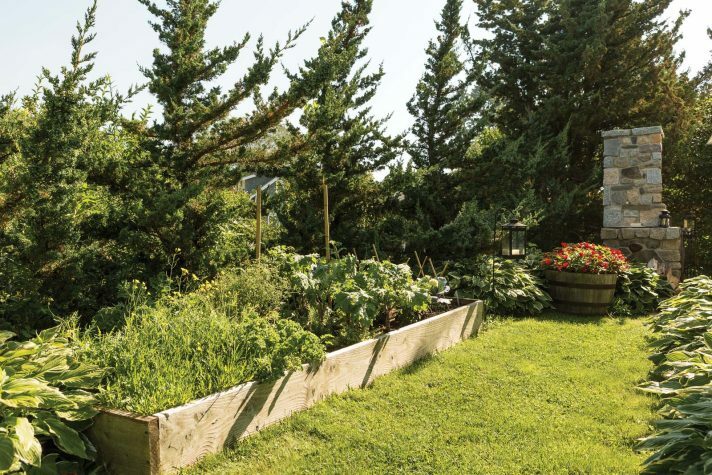 The nineteenth-century cottage in Kennebunk has landscaping by Ted Carter. It was important to the family that the original structure wouldn't be compromised during renovations. Days are spent at the beach. Over the years, the family has formed strong friendships here. “We have friends who come back every summer. It’s lovely,” says homeowner Sylvie Chagnon. 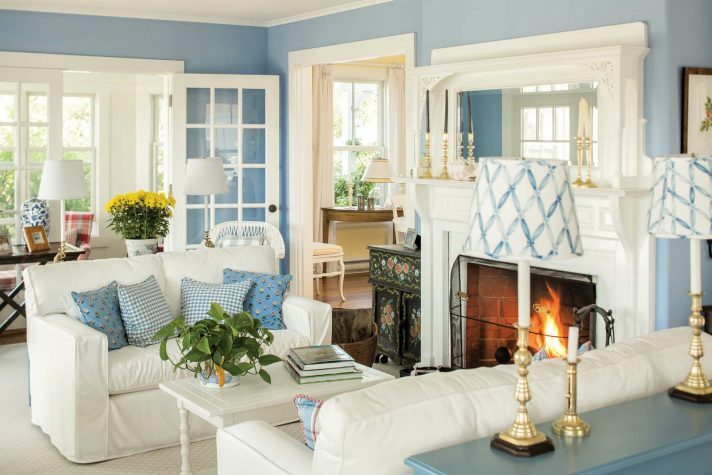 The blue living room is simple with white furniture. All of the textiles were carefully selected by Chagnon to easily blend with the carefree design. Since the original kitchen was often a gathering place during parties, the Chagnons wanted to open it up. Additionally, the brown cabinets were painted white, and Indisco Kitchens and Baths in Scarborough was hired to replace all of the cabinet doors with bead-board façades. A Dutch door opens to a screened porch on the east side of the house where the living space naturally extends to the outdoors. 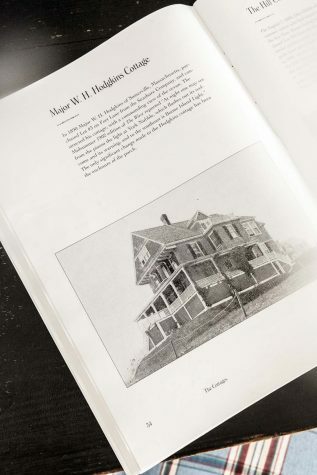 The Chagnon cottage is featured in the book Quiet, Well Kept, for Sensible People: The Development of Kennebunk Beach from 1860-1930 by Rosalind Magnuson. The red room was well thought out by homeowner Sylvie Chagnon. The fabric for the gingham drapes was selected in Montreal and made by Louise Binette Custom Draperies in Sanford. One of the best attic finds was the red coffee table that blends perfectly into the room. 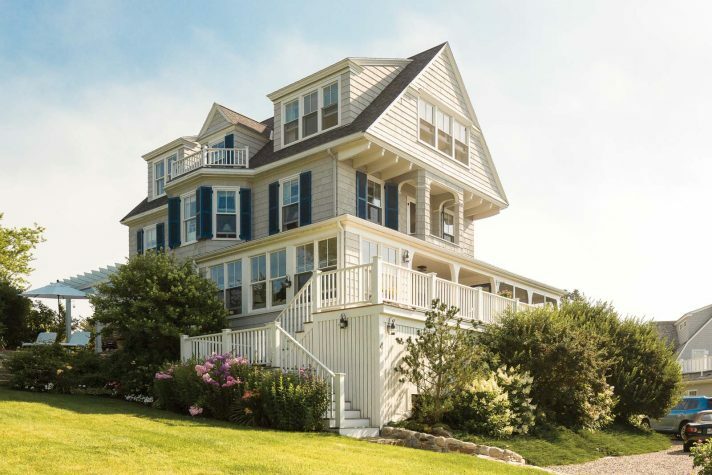 The owners’ suite on the third floor has sweeping views of Kennebunk Beach. 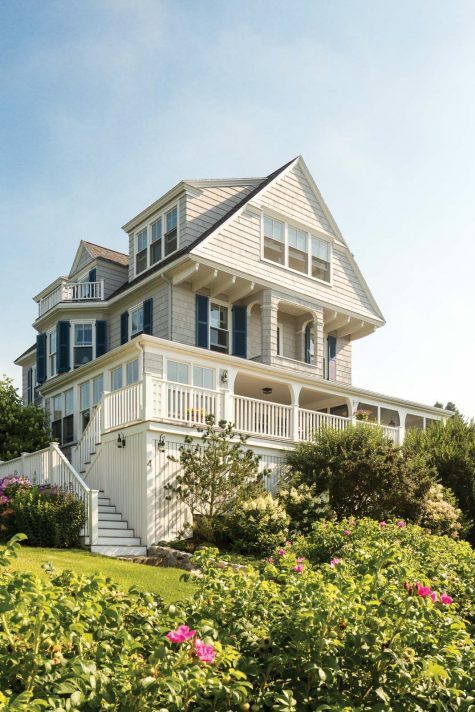 Three dormers were added along with oversized Anderson windows to take advantage of the views. Raised beds were put in so there would always be fresh vegetables and fruit in the home. 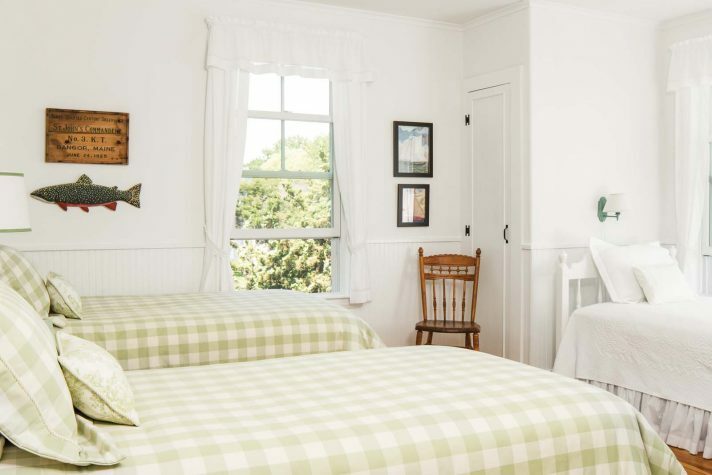 All of the bedrooms have white walls with slight nautical accents. This guest room is elegantly designed to easily sleep up to three people. 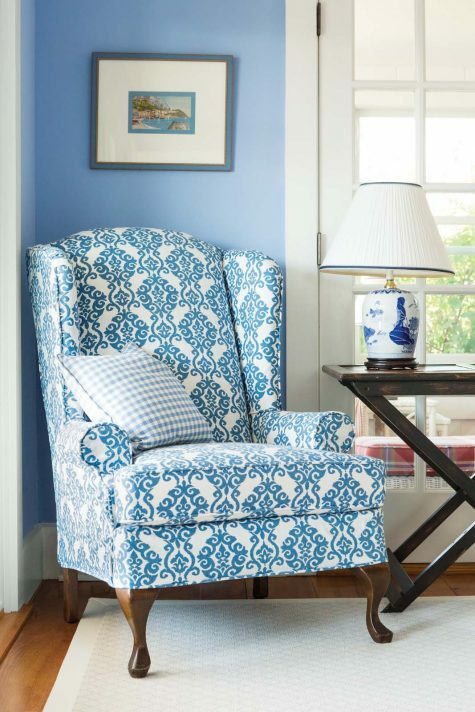 Chagnon selected a blue and white textile that would complement the blue walls in the living room. 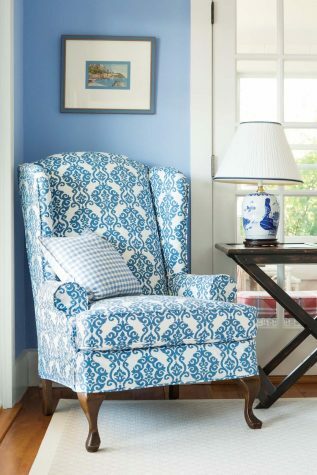 Peggy’s Workroom in Lyman, Maine, used it to create a custom slipcover for this old wingback chair. 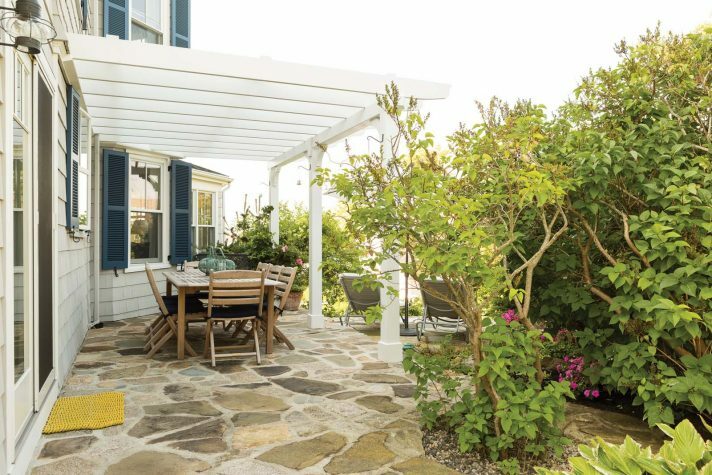 On the west side of the house contractor Robert Mason built a pergola over the stone patio designed by Stonework by Vangaasbeek. Almost all of the furniture in the dining room was left by the previous owners and given new life. 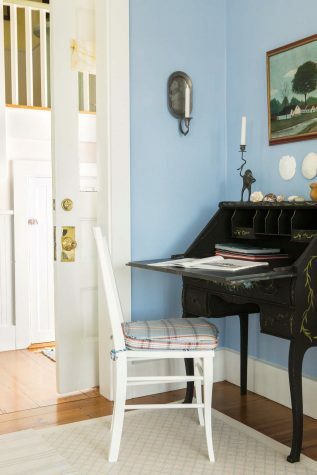 An antique secretary desk in a corner of the living room. Certain places from childhood imprint on our memories. For Sylvie Chagnon, one of those places is Kennebunk. She started coming to Maine with her family when she was just six months old. “Maine is in our blood,” she says. “A family passion. My father used to go with my grandfather when he was a child.” The drive from Sylvie and her husband’s home in Montreal to Kennebunk is a little over 5 hours, much less than the 12 hours to the coasts of New Brunswick and Prince Edward Island. Jean and Sylvie Chagnon’s primary residence is nestled between two hills in Westmount, a small municipality within the larger city of Montreal, Quebec. 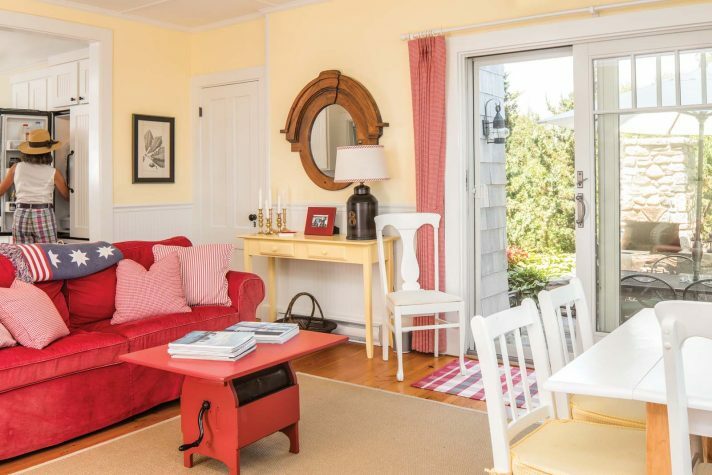 The couple had been renting in Kennebunk for more than 30 years, 20 years in the same rental, a place they loved returning to year after year. One summer, however, they arrived to find that the house had been completely updated. “I turned to my husband and said, ‘The writing is on the wall: we’re going to lose this place,’” Sylvie recalls. The couple soon found out that it would indeed be their last summer in the house. The two had always dreamed of owning their own home in Kennebunk, because for them summers in Maine were also about family. They have three sons and three grandsons (with a fourth on the way), and everyone has come to stay with them each summer. After discussing it at length, the Chagnons decided that they would buy a house and make Kennebunk their summer home. But they immediately ran into difficulties: “We thought all the houses would be as wonderful as the one we rented, but we were wrong,” says Sylvie. The couple looked at several houses, but none of them fit their needs, and the search started to seem hopeless. 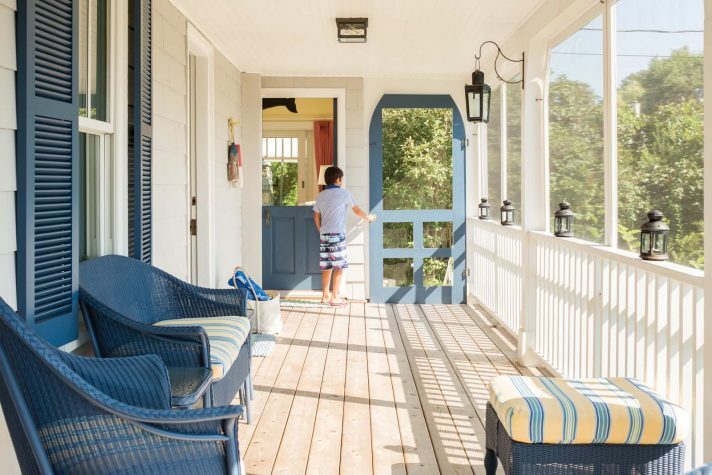 Finally, one of their close friends showed them a cottage-style home with a beautiful wraparound porch and sweeping views from almost every room. Sylvie’s initial reaction was that the house was just too big. But she couldn’t get it out of her mind. She and Jean returned to the house 12 more times before they finally made an offer. “It is a house that has a soul,” she says. The three-floor cottage, built in 1890 by Major W.H. Hodgkins, is set back just a block from Kennebunk Beach. 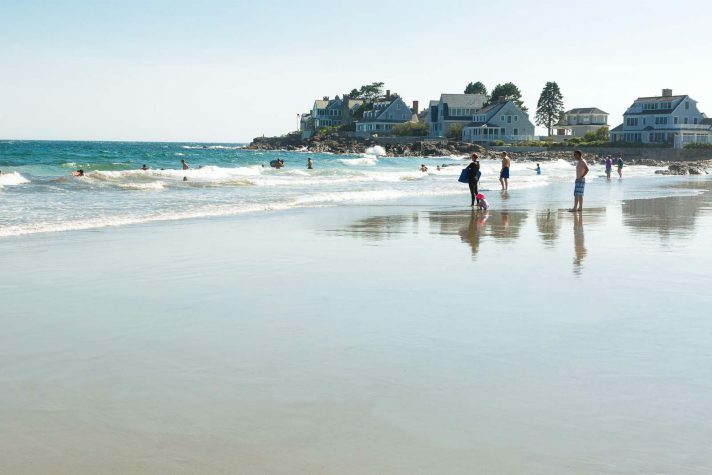 This seaside town was originally an agricultural and shipbuilding settlement, and the cottage was one of the first houses to go up along the beach with those on Lord’s Point (a spot of land below Kennebunk Beach). “It is easily livable but also has an elegance,” says Sylvie. The cottage has always been a summer home, and the Chagnons have no intention of ever winterizing it. One August afternoon Sylvie was having lunch on the patio when she saw a group of people in front of her home. A man was pointing up at the house, so she walked down to say hello. The man was from the Brick Store Museum in Kennebunk, he told her, and the house was part of their walking tour every Friday, because it is one of the best preserved historic houses on Kennebunk Beach. After finally finding the right house, it was important to the couple that they really get to know it before they contemplated any renovations. That first summer they discovered the ins and outs of their new summer cottage. The one space they immediately knew they wanted to change was the attic. A narrow staircase led to a dark room that had designated for storage and long been neglected. If you bent down and looked out the tiny windows, you could see the beacon of the Nubble Light in York. Once they saw the view, they instantly knew it would be their sleeping quarters. The Chagnons contacted architect John W. Einsiedler to draw up plans for the renovation. One of the stipulations the Chagnons made during the redesign was to maintain the integrity of the house. It needed to stay true to its original nineteenth-century form. 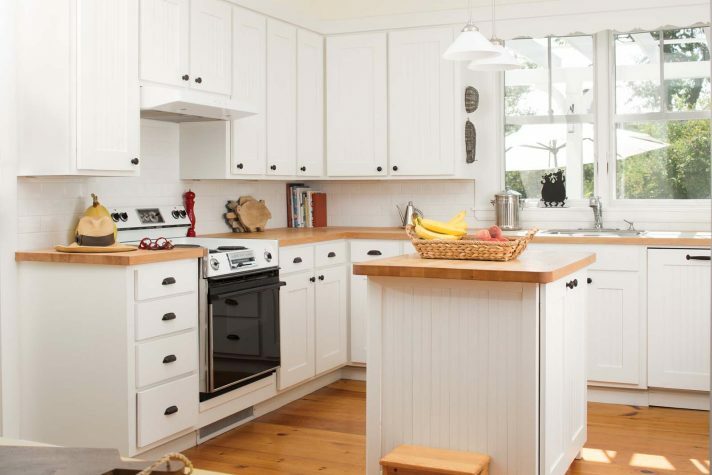 After an involved design process, they settled on a final plan and hired contractor Robert Mason, a childhood friend of their Kennebunk neighbors. The attic was insulated, and the deteriorated framing was replaced. Three dormers were added to the third floor to add space and expand the views. An owners’ suite consisting of the bedroom, a full bathroom, and an office space was created. “They have the best view in Kennebunk from that third-floor space,” says Mason. Large windows were added to take advantage of the views in all directions. 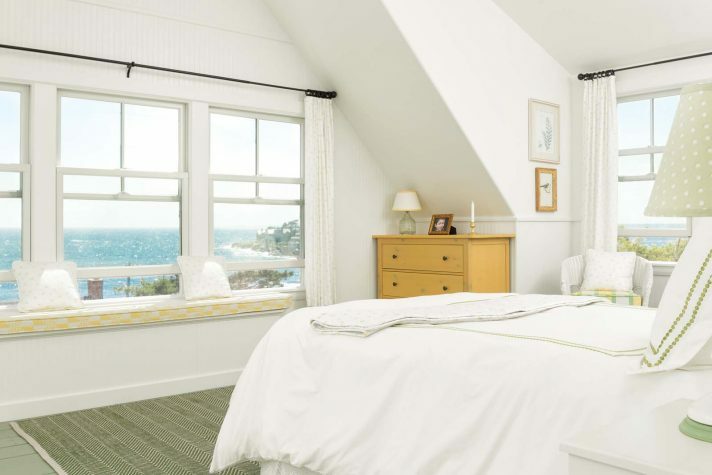 From that one room, the Chagnons have views of Parson’s Beach, Mount Agamenticus, and Nubble Light. The house can sleep up to 16 people in its five bedrooms. All of the grandchildren sleep in one room, its walls decorated with drawings the children have made in summers past. All of the bedrooms are painted white, but each room downstairs is a different color. “I’m like Jackie Kennedy: every room has a color,” says Sylvie. 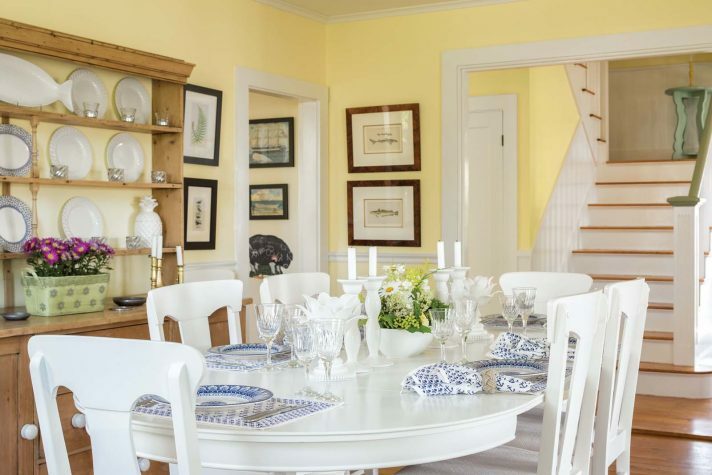 “I’ll never forget watching the White House tour on television when I was 11 years old after she made the renovations—I was fascinated by that woman.” There’s the blue living room, the yellow dining room, the red family room, and a green bathroom. When the Chagnons bought the house, it came with all the furniture. “I thought we might have been given a poisonous gift,” laughs Sylvie. She brought in her daughter-in-law, and together they vetted all the furniture. They happily discovered some sturdy pieces that, with a little love, would work. “It was like Goldilocks and the Three Bears: we tried all of the chairs and beds,” she adds. Some of the best pieces were found up in the attic. Broken pieces were fixed, and local painters added fresh coats of vibrant colored paint. Outside, the Chagnons had some work to do on the landscape. The property was all overgrown, so they brought in landscape architect Ted Carter of Ted Carter Inspired Landscapes in Buxton. “When I work on a project, I get to know my client’s style, and Sylvie has an extraordinary color palette,” says Carter. Together they decided on relaxed, low-maintenance plantings reminiscent of the late nineteenth and early twentieth century. There’s an assortment of elegant, smaller flowers, including a variety of lilacs and hydrangeas, mixed with more unusual, stand-alone plantings like Japanese pine. Every plant was selected to blend with the charm of the cottage. “We tried to be sincere to what an early-1900s landscape would look like,” says Carter. The drive from Montreal to Kennebunk brings back happy memories for Sylvie. She and Jean always take her father’s route through the mountains, passing through Crawford Notch, New Hampshire. After they arrive, they move easily through their days at the cottage: breakfast on the patio, then everyone is off and free to do what they want. The house is designed to support the couple’s love of the outdoors. Summer days drift away with bike rides to town, walks on the beach, and antiquing. But everyone always returns for meals. 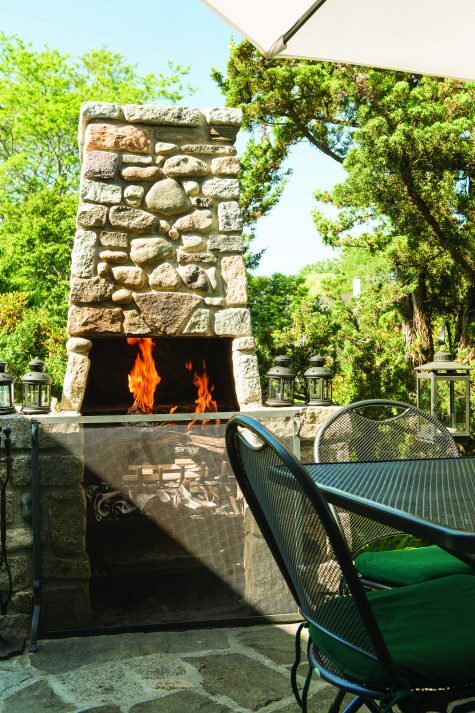 The Chagnons built a stone patio and fireplace off the family room so they can eat dinner outside into October. There’s always music playing; typically it’s Brazilian samba at high volume. The grandchildren have free rein of the house. In the winter months, the garage is used to store outdoor furniture and cars, but in the summer it’s a play area for the kids. When they need to take a break from the sun and the beach, the space is set up with tables on which to build toy ships and create Lego villages. “It’s just impossible to not be happy here,” says Sylvie. It was important for the family to be able to eat outside on cooler nights. Stonework by Vangaasbeek designed a cozy fireplace and patio.